"Blood count" redirects here. For the jazz composition, see Blood Count. Schematics (also called "Fishbones") of shorthand for complete blood count commonly used by clinicians. The format above is used more often in the US. Hgb=Hemoglobin, WBC=White blood cells, Plt=Platelets, Hct=Hematocrit. A complete blood count (CBC) is a blood panel requested by a doctor or other medical professional that gives information about the cells in a patient's blood, such as the cell count for each blood cell type and the concentrations of hemoglobin. A scientist or lab technician performs the requested testing and provides the requesting medical professional with the results of the CBC. Blood counts of various types have been used for clinical purposes since the nineteenth century. Automated equipment to carry out complete blood counts was developed in the 1950s and 1960s. Most blood counts today include a CBC count (i.e. : complete blood count) and leukocyte differential count (LDC) that gives the percentage of each WBC type, such as neutrophils, eosinophils, basophils, monocytes, and lymphocytes). The cells that circulate in the bloodstream are generally divided into three types: white blood cells (leukocytes), red blood cells (erythrocytes), and platelets (thrombocytes). Abnormally high or low counts may indicate the presence of many forms of disease, and hence blood counts are among the most commonly performed blood tests in medicine, as they can provide an overview of a patient's general health status. A CBC is routinely performed during annual physical examinations in some jurisdictions. Complete blood counts are done to monitor overall health, to screen for some diseases, to confirm a diagnosis of some medical conditions, to monitor a medical condition, and to monitor changes in the body caused by medical treatments. For patients who need blood transfusion, a blood count may be used to get data which would help plan an amount of treatment. In such cases, the person should have only one blood count for the day, and the transfusion of red blood cells or platelets should be planned based on that. Multiple blood draws and counts throughout the day are an excessive use of phlebotomy and can lead to unnecessary additional transfusions, and the extra unnecessary treatment would be outside of medical guidelines. A phlebotomist collects the sample through venipuncture, drawing the blood into a test tube containing an anticoagulant (EDTA, sometimes citrate) to stop it from clotting. The sample is then transported to a laboratory. Sometimes the sample is drawn off a finger prick using a Pasteur pipette for immediate processing by an automated counter. Before the advent of automated hematology analyzers, CBCs were performed manually, by counting cells in a diluted sample of blood on a device called a hemocytometer, and by viewing a slide prepared with a sample of the patient's blood (a blood film, or peripheral smear) under a microscope. However, manual blood cell counts are becoming less common, and instead this process is generally performed by the use of an automated analyzer. 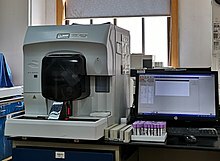 Complete blood count performed by an automated analyser. Differentials not seen here. Typically, analysis begins when a well mixed whole blood sample is placed on a rack in the analyzer. The instrument utilizes flow cells, photometers and apertures in order to analyze different elements in the blood. The cell counting component counts the numbers and types of different cells within the blood. A special photometer called a hemoglobinometer measures the amount of hemoglobin. This is done by adding a diluent that lyses the red blood cells which is then pumped into a spectro-photometric measuring cuvette. The change in color of the lysate equates to the hemoglobin content of the blood. This information can be very helpful to a physician who, for example, is trying to identify the cause of a patient's anemia. The results are printed out or sent to a computer for review. Blood cell counting occurs by flow cytometry when a very small amount of the specimen is aspirated, diluted and passes through an aperture and a laser flow cell. Sensors count and identify the number of cells passing through the aperture. The two main types sensors used are laser light detectors and electrical impedance. The instrument determines the type of blood cell by analyzing data about the size and aspects of light as they pass through the cells. Some instruments measuring different characteristics of the cells in order to categorize them. Because an automated hematology cell counter samples and counts so many cells, the results are very precise. However, certain abnormal cells in the blood may not be identified correctly, requiring manual review of the instrument's results and identification by other means (such as microscopy) of any abnormal cells the instrument could not categorize. Sophisticated modern analyzers can provide extended WBC differential counts, which include hematopoietic progenitor cells, immature granulocytes, and erythroblasts. Various Red blood cell indices (parameters calculated from other CBC results) are often reported in addition to cell counts and hemoglobin. Automated hematology analyzers calculate the average amount (MCH) and concentration (MCHC) of hemoglobin within each red blood cell. Average RBC size (MCV) and shape (RDW) are also calculated to provide additional diagnostic information. For example, if the red cells are smaller or larger than normal, or if there is a lot of variation in the size of the red cells, this data can help guide the direction of further testing and expedite the diagnostic process so patients can get the treatment they need quickly. Manual blood counts use a light microscope, usually with a specialized microscope slide, which is called a hemocytometer. This shows the view through the microscope of the specialized hemocytometer slide. The built-in grid simplifies counting cells by helping the technician keep track of which cells have already been counted. To identify the numbers of different white cells, a blood film is made on a slide, and a large number of white blood cells (at least 100) are counted using a microscope. This gives the percentage of cells that are of each type. By multiplying these percentages by the total number of white blood cells, the absolute number of each type of white cell can be obtained. Manual microscopic counting is useful in cases where automated analyzers cannot reliably count abnormal cells, such as those immature or atypical cells (that are not present in normal patients) and are only seen in peripheral blood with certain haematological conditions. Manual counting is subject to sampling error because so few cells are counted compared with automated analysis. Medical technologists examine blood film via a microscope for some CBCs, not only to find abnormal white cells but also because variation in the shape of red cells is an important diagnostic tool. Although automated analysers give fast, reliable results regarding the number, average size, and variation in size of red blood cells, they do not identify specific shapes. Also, some normal patients' platelets will clump in EDTA anticoagulated blood, which causes automatic analyses to give a falsely low platelet count. The person viewing the slide in these cases will see clumps of platelets and can estimate if there are low, normal, or high numbers of platelets. 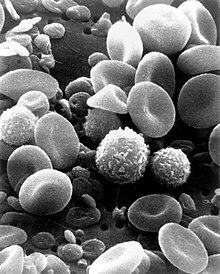 A scanning electron microscope (SEM) image of normal circulating human blood. One can see red blood cells, several knobby white blood cells including lymphocytes, a monocyte, a neutrophil, and many small disc-shaped platelets. Total white blood cells are reported, and a differential reports all the white cell types as a percentage and as an absolute number per unit volume. A high WBC may indicate an infection, leukemia or some other hematological disorder. Neutrophils: May indicate bacterial infection, and are seen in leukemias. They may also be raised in acute viral infections. Because of the segmented appearance of the nucleus, more mature neutrophils are sometimes referred to as "segs". The nucleus of less mature neutrophils is not segmented, but has a band or rod-like shape. Less mature neutrophils are known as "bands" or "stabs". Stab is a German term for rod. Lymphocytes: Higher with some viral infections such as glandular fever. Raised in chronic lymphocytic leukemia (CLL) and other lymphocytic leukemias. Counts may be decreased by HIV infection. In adults, lymphocytes are the second most common WBC type after neutrophils. In young children under age 8, lymphocytes are more common than neutrophils. Eosinophils: Increased in parasitic infections, asthma, or allergic reaction. Basophils: May be increased in bone marrow related conditions such as leukemia or lymphoma. Total red blood cells: The number of red cells is given as an absolute number per litre. Iron deficiency anemia is one condition that shows up as a Low RBC count. Hemoglobin: The amount of hemoglobin in the blood, expressed in grams per decilitre. A low level of hemoglobin is a sign of anemia. Hematocrit or packed cell volume (PCV): This is the fraction of whole blood volume that consists of red blood cells. RBC Indices are typically calculated from other measured RBC parameters. They include the MHC, MCHC, MCV and RDW. Automated analyzers measure MCV directly, and use it and the RBC to calculate the Hematocrit. Mean corpuscular volume (MCV): the average volume of the red cells, measured in femtolitres. Anemia is classified as microcytic or macrocytic if the MCV value is above or below the expected normal range; anemias are classified as normocytic if the MCV is within the expected range. Other conditions that can affect MCV include thalassemia, reticulocytosis, alcoholism, chemotherapy, vitamin B12 deficiency, and/or folic acid deficiency. Mean corpuscular hemoglobin (MCH): the average amount of hemoglobin per red blood cell, in picograms. Mean corpuscular hemoglobin concentration (MCHC): the average concentration of hemoglobin in red blood cells. In Hypochromic anemia, such as caused by an iron deficiency, the MCHC is decreased. Red cell distribution width (RDW): reflects the degree of variation in size and shape of red blood cells as calculated by automated analyzers. RDW determination, in conjunction with RBC count and MCV, is useful in the interpretation of several hematological disorders. The RDW is measured as a coefficient of variation of red cell size distribution. Platelet numbers are given, as well as information about their size and the range of sizes in the blood. Mean platelet volume (MPV): a measurement of the average size of platelets. An example of reference ranges for a complete blood count. Note that test names, measurement units and reference ranges may vary between countries and laboratories. Patient results should always be interpreted using the units and reference ranges from the laboratory that produced the results. Example of reference ranges for blood tests of white blood cells. Many disease states are heralded by changes in the blood count: leukocytosis can be a sign of infection; thrombocytopenia can result from drug toxicity; pancytopenia is generally referred to as the result of decreased production from the bone marrow, and is a common complication of cancer chemotherapy. ^ Verso, ML (May 1962). "The Evolution of Blood Counting Techniques". Read at a Meeting of the Section of the History of Medicine, First Australian Medical Congress. 8 (2): 149–58. doi:10.1017/s0025727300029392. PMC 1033366. PMID 14139094. ^ a b Buttarello, M; Plebani, M (July 2008). "Automated blood cell counts: state of the art". American Journal of Clinical Pathology. 130 (1): 104–16. doi:10.1309/EK3C7CTDKNVPXVTN. PMID 18550479. ^ Mayo Clinic (14 February 2014). "Complete blood count (CBC) Why it's done – Tests and Procedures". mayoclinic.org. Retrieved 29 July 2014. Napolitano, LM; Kurek, S; Luchette, FA; Corwin, HL; Barie, PS; Tisherman, SA; Hebert, PC; Anderson, GL; Bard, MR; Bromberg, W; Chiu, WC; Cipolle, MD; Clancy, KD; Diebel, L; Hoff, WS; Hughes, KM; Munshi, I; Nayduch, D; Sandhu, R; Yelon, JA; American College of Critical Care Medicine of the Society of Critical Care, Medicine; Eastern Association for the Surgery of Trauma Practice Management, Workgroup (December 2009). "Clinical practice guideline: red blood cell transfusion in adult trauma and critical care". Critical Care Medicine. 37 (12): 3124–57. doi:10.1097/CCM.0b013e3181b39f1b. PMID 19773646. ^ a b "Red Blood Cell (RBC) Indices: Definitions and Calculations - LabCE.com, Laboratory Continuing Education". www.labce.com. ^ Tan, GC; Stalling, M; Dennis, G; Nunez, M; Kahwash, SB (2016). "Pseudothrombocytopenia due to Platelet Clumping: A Case Report and Brief Review of the Literature". Case Reports in Hematology. 2016: 1–4. doi:10.1155/2016/3036476. PMC 5164902. PMID 28044112. ^ a b c d e f g David C., Dugdale (19 March 2012). "CBC: MedlinePlus Medical Encyclopedia". MedlinePlus. United States National Library of Medicine. Retrieved 29 July 2014. ^ a b c d "Complete Blood count with Differential". RbCeus.com. 2013. Retrieved 21 November 2014. This page was last edited on 7 April 2019, at 07:28 (UTC).